Retail is one of the fastest growing sectors of the service economy – and one that can include extremely unpredictable work scheduling. While retail positions are generally recognized as “bad jobs” because of their poor wages and benefits, scheduling makes these jobs particularly challenging. Our interviews with 55 clothing retail workers highlight the unpredictability of when workers receive the schedule, the amount of hours they’ll work, whether they’ll be called in last minute, and sometimes, when they can clock out. These practices are part of “just-in-time scheduling,” which link employment hours to customer demand. In this arrangement employers essentially expect workers to be available whenever the store gets busy. Our study highlights that clothing retail workers experience their employers’ scheduling practices as difficult to navigate. Workers see their employers as both rewarding them with better schedules (since promotions and pay raises are rare) and punishing them by removing them from the schedule, rather than firing them. Scheduling appears to be clothing retail employers’ main means of disciplining workers. Some retailers combine inconsistency with “call-ins.” Part-time workers receive an on-call shift every week, which involves calling the manager to see if they need them to work that day. One worker explains, “You have to call in an hour before. It takes me 20 minutes to drive to the mall so like I’m just waiting around, like you can’t make plans. [Call-ins] were annoying.” Susan Lambert argues that retail firms monitor the ratio of workers to sales hourly and make staff adjustments throughout the day, with a real cost to workers. Although workers are generally unhappy about getting fewer hours than they need, some note that their schedules are also challenging when they unexpectedly work very long hours. One worker says that changing the sales floor arrangement often requires more labor than predicted: “I came in the store [at] like nine o’clock at night, and we were doing a floor set that was supposed to go until midnight, and I left the store at six the next morning.” Scheduling employees to complete tasks faster than possible is a key trend in clothing retail. A major piece of this just-in-time production is matching the staffing of the store to customer flow. When stores get busy, workers comment that the store is often short staffed. Inadequate staffing makes the expectation of maintaining a clean, well-organized sales floor almost impossible. The production speed up leads to workers hurriedly folding clothes and avoiding lengthy customer interactions. The speed up cannot functionally address the mess customers make on busy days. 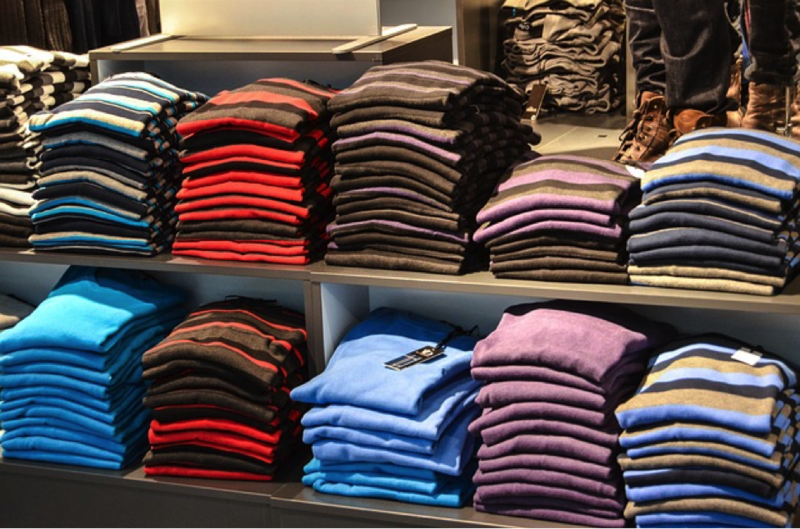 Inevitably, meticulously folded stacks of shirts, sweaters, and slacks transform into colorful piles of textiles. From the clothing strewn about display tables to the racks of “go backs,” or items that customers took into fitting rooms but did not purchase, stores become jumbled. One worker recalls that by closing time, “The fitting room would be overflowing with clothes that we just didn’t have time to put back. We’d have like ten, twenty racks in there of unsorted clothing.” Managers then ask workers to stay hours past when they were originally scheduled to tidy the mess. We heard numerous workers recall “folding down” the store until 2 am when they were scheduled to leave work at 10 pm. Rewards are relatively few and far between in clothing retail work. The participants in our study rarely received pay raises, or had only gained a few pennies more, resulting in most workers earning minimum wage or slightly above it. In need of incentives, managers use schedules to compensate good workers. Given the unpredictability of hours and the low pay, a reasonable schedule becomes paramount. Workers emphasize needing more hours and more consistency in earnings because they are realistic about the low chance of receiving a noticeable raise or a promotion. Managers seem to deliver in cases where they see workers as deserving of rewards for their positive attitude, attention to detail, and general contribution of quality hard work. Senior workers may receive a consistent part-time schedule of about 15-25 hours per week, whereas other workers’ schedules fluctuate widely according to customer flow. Some workers say that favoritism, rather than hard work and seniority, leads to better schedules for themselves or their coworkers. Scheduling is one of the key issues in clothing retail work. Employers use schedules to reward and punish their workers. Workers feel beholden to employers since they need a certain number of hours to survive. Yet they’re asked to work with little notice and no guarantees, with staffing too short to successfully complete their tasks. Our findings mirror Christine Williams’ research, which shows that these erratic scheduling practices reproduce race and gender inequality in the workplace. There are many possibilities for changing these practices. Some workers in our sample, particularly those in department stores, have consistent schedules that allow them to earn more predictable incomes. These workers tend to be more satisfied and less likely to seek other jobs. The Abercrombie chain recently announced it will eliminate call-in shifts, signaling that retailers are willing to improve. Changing current labor law to address the most destructive just-in-time scheduling practices is a crucial next step, and one that may well be a win-win by reducing turnover and increasing profitability for retail companies. Kyla Walters is a Ph.D. candidate in the Department of Sociology at University of Massachusetts-Amherst. Joya Misra is Professor of Sociology and Public Policy at University of Massachusetts-Amherst. Their retail work research project received support from the Labor Research & Action Network.